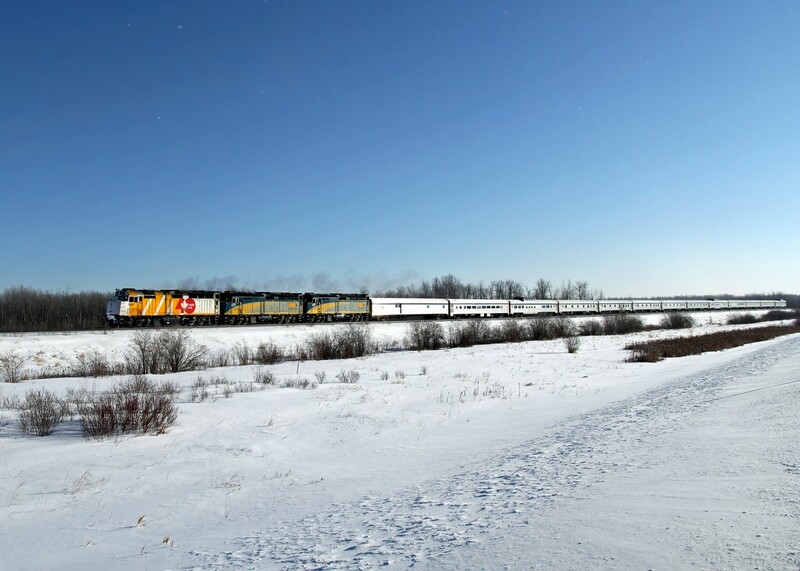 Railpictures.ca - colin arnot Photo: Another daylight viewing opportunity for VIA #1. This time about 30 hours late cruising through Uncas at a leisurely 40 mph behind two freight trains. Worth the -30C temp to see 40th Anniversary 6402 in the lead followed by 6410 and 6435. | Railpictures.ca – Canadian Railway Photography – photographie ferroviaire Canadienne. Copyright Notice: This image ©colin arnot all rights reserved. Caption: Another daylight viewing opportunity for VIA #1. This time about 30 hours late cruising through Uncas at a leisurely 40 mph behind two freight trains. Worth the -30C temp to see 40th Anniversary 6402 in the lead followed by 6410 and 6435. Lots of power for a comparatively short train. Is that a winter thing, reserves in case of failures, or just a stock move?